The Boost® Software Poland Team took a trip to strengthen their already-tight working relationship. As a result, they come back refreshed and ready to take on new company challenges. Team activities they participated in include archery, fishing, bomb defusing and performance sports. Boost Poland said they had some laughs while playing these team-building games. 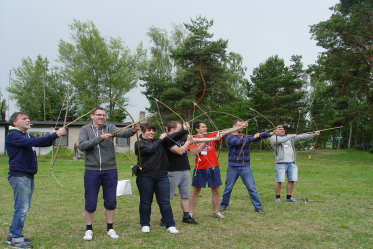 From June 12 -15, Boost Poland participated in Team Building Tricity. This event covered Gdańsk, Gdynia and Sopot as well as nearby minor towns in Pomerania. “We set off in the morning in good moods, happy and excited to let our hair down,” said Mariusz Kilian, Boost Poland’s Technical Director. Nine team members participated in this event: Mariusz Kilian, Iwona Wyszyńska, Monika Raciborska, Grzegorz Paciejuk, Grzegorz Raciborski, Marek Jakimiuk, Stan Ruchlicki, Karol Zdancewicz and Roberto Fusco. This team makes up some of the employees assigned to the Boost Software development department. They’re the ones who work daily on new updates for PC HealthBoost® and PC SpeedBoost™ software. While involved in the Tricity Team Building Event, they participated in activities to help them improve communication and leadership skills. They also reportedly took some time to write the “Boost Software” logo in the sand while at the beach. According to Technical Director Mariusz Kilian, they wrote the company name on the beach to make their presence felt. After participating in the above-mentioned activities, they then made bows with their own hands. Then, they shot arrows for a while. However, the 40-kilometer bike trip reportedly was the crowning of their trip. During this event, they traveled across sea landscapes while enduring harsh weather conditions. The group said they weren’t bored at all during the entire trip. Furthermore, they apparently experienced the highest level of comfort when not outdoors. They all slept at the Sheraton Hotel in Sobot. The areas where the team visited – especially Sobot – are known as the most beautiful spots in Europe to visit. They appeared to have made the most of this mini-vacation, even if it did have a work focus. The Boost Software Poland office opened in 2013 to promote help develop software for the company, offering fast solutions for people who want to Boost PC Speed. To learn more, please visit BoostSoftware.com.